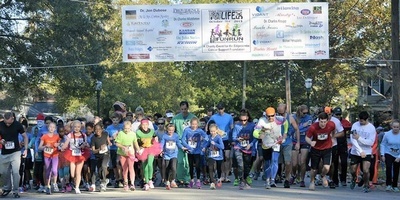 6th annual Halloween fundraising run/walk for the Edgecombe Cancer Support Foundation. Run/walk through beautiful downtown Tarboro, a Nature trail, and surrounding farm. Start is at the Tarboro Brewing Company! Timed race with race Tshirts, Prizes, and Awards. Prizes!!! for best costumes. Come dressed as your favorite Halloween Character. The race is a fund raiser for the Edgecombe Cancer Support Foundation Inc. It's Mission is to financially assist residents of Edgecombe County actively being treated for cancer. Many people assume that the needs of cancer patients are being completely met. However, given the changing times and the rising cost of health insurance, treatment costs, and cost of living increases, there are a great number of cancer patients who are in need financially. The Cancer Fund will strive to assist those needs when it comes to financial concerns. 100% of the money raised will go towards Cancer patients of Edgecombe County. PACKET PICKUP: FRIDAY 10/26/17 5-8 PM at TBC 526 N Main Street, Tarboro, NC and SATURDAY 10/27/17 7-8:30 AM AT THE TARBORO BREWING COMPANY 526 N Main Street. The Edgecombe Cancer Support Foundation is here to financially assist cancer patients of Edgecombe County. Many people assume that the needs of cancer patients are being completely met. However, given the changing times and the rising cost of health insurance, treatment costs, and cost of livig increases, there are a great number of cancer patients who are in need financially.